Epstein-Barr virus (EBV) infection is associated with development of human B cell lymphomas. The EBV oncoprotein LMP1 is required for malignant transformation of B cells in vitro; however, many EBV-positive lymphomas from patients have little or no LMP1 expression. Although persistence of EBV in LMP1-negative tumors suggests a selective advantage, the ability of LMP1-deficient EBV to cause lymphoma has not been demonstrated in animal models. Shi-Dong Ma and colleagues at the University of Wisconsin developed a murine model of lymphomagenesis in which EBV-infected human cord blood mononuclear cells are injected intraperitoneally into immune-deficient animals. In this model, cells infected with LMP1-deficient EBV established lymphomas at a similar frequency as cells infected with WT EBV. While WT EBV-infected cells did not require T cell signals for lymphoma formation, LMP1-deficent EBV-infected cells required the presence of CD4+ T cells for B cell lymphoma development. CD40 was also required for lymphoma development, as anti-CD40 antibody treatment reduced lymphomagenesis in animals given either WT or LMP1-deficient EBV-infected cord blood. The results of this study indicate that LMP1 is not essential for EBV-induced lymphomagenesis and that T cell signals can compensate for LMP1 deficiency. 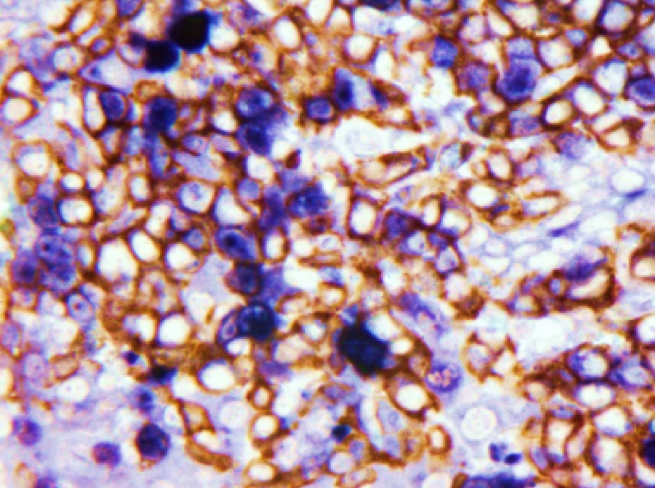 The accompanying image shows immunohistochemical staining of LMP1-deficent EBV-induced lymphomas that have invaded the pancreas. Ki67 staining (purple) indicates active proliferation of the infiltrating CD20-positive B cells (brown). Citation Information: J Clin Invest. 2015;125(1):304-315. https://doi.org/10.1172/JCI76357. Epstein-Barr virus (EBV) infection transforms B cells in vitro and is associated with human B cell lymphomas. The major EBV oncoprotein, latent membrane protein 1 (LMP1), mimics constitutively active CD40 and is essential for outgrowth of EBV-transformed B cells in vitro; however, EBV-positive diffuse large B cell lymphomas and Burkitt lymphomas often express little or no LMP1. Thus, EBV may contribute to the development and maintenance of human lymphomas even in the absence of LMP1. Here, we found that i.p. injection of human cord blood mononuclear cells infected with a LMP1-deficient EBV into immunodeficient mice induces B cell lymphomas. In this model, lymphoma development required the presence of CD4+ T cells in cord blood and was inhibited by CD40-blocking Abs. In contrast, LMP1-deficient EBV established persistent latency but did not induce lymphomas when directly injected into mice engrafted with human fetal CD34+ cells and human thymus. WT EBV induced lymphomas in both mouse models and did not require coinjected T cells in the cord blood model. Together, these results demonstrate that LMP1 is not essential for EBV-induced lymphomas in vivo and suggest that T cells supply signals that substitute for LMP1 in EBV-positive B cell lymphomagenesis.